When I reviewed the Einscan-SE & SP I was surprised by the quality they produce, especially for their affordable prices. 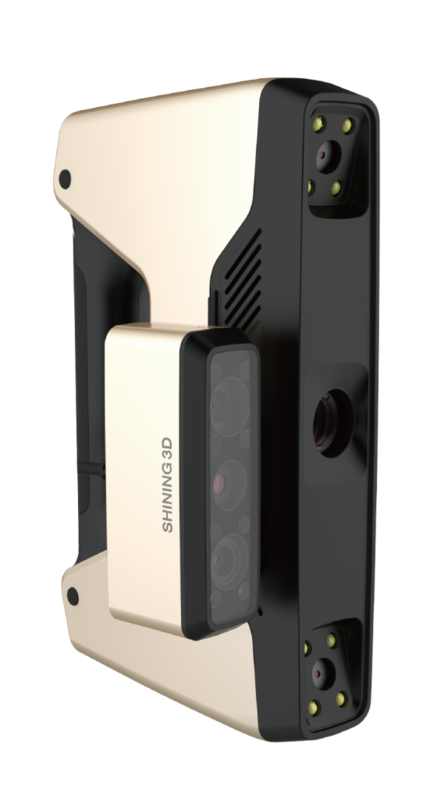 But as you might know, I’m all about “3D Scanning Beyond Engineering” and focus a lot on creating assets for commercial applications, cultural heritage, visual effects and interactive development like games, VR and AR. And while technical purposes mainly focus on geometric quality, for those creative, cultural and commercial purposes color quality matters just as well. Most stuctured light desktop scanners, including the EinScan line, only have monochrome cameras. They can capture color but only by projecting red, green and blue frames onto the object and reverse-engineering the color channels. This works reasonably well but is not as perfect as a dedicated RGB color camera. 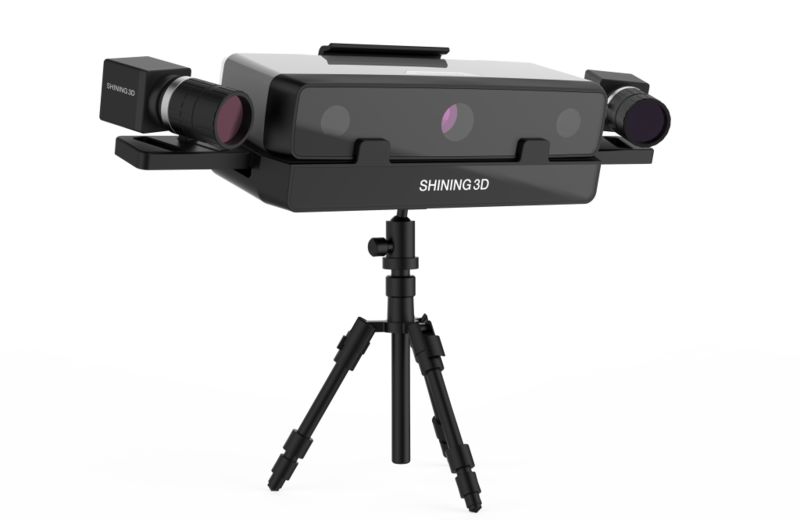 To solve is problem and help users create 3D models with photo-realistic textures, Shining 3D announced the EinScan Discovery Pack. As you can see in the image above, this pack adds two extra camera’s to the scanner head. And while most Color Modules (even the one on the EinScan-Pro and Pro+) contain just a 1.3 megapixel camera, the Discovery Pack features a 12 megapixel resolution with support for 24-bit color capture. 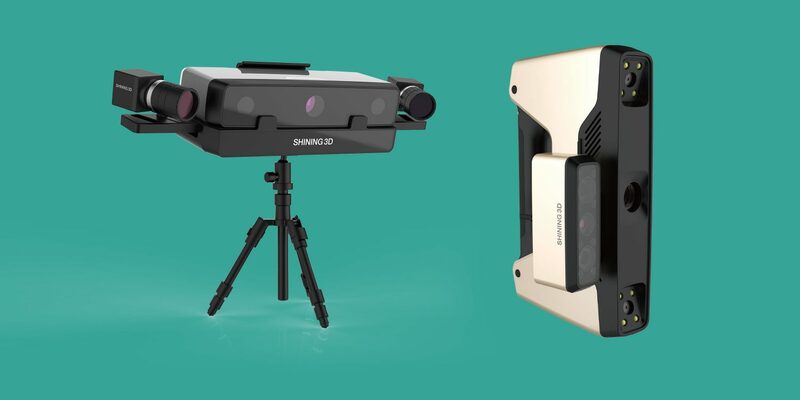 It’s compatible with both the SE and SP scanners, which basically means that you can now use an affordable active 3D scanner to scan high-resolution geometry with the addition of photogrammetry-quality textures. I can’t wait to test this and compare it to actual photogrammetry data. When I reviewed the EinScan-Pro+ I discovered that Shining 3D had made great improvements to the Handheld HD scan mode compared to the EinScan-Pro but that I still favored the Rapid Handheld Mode because of it’s speed, ease-of-use and ability to scan without markers. This module allows the user to scan in Handheld HD mode without using trackers and with a 30% speed increase. This basically means scanning with 0.1 mm accuracy with a point distance of 0.2 – 3 mm, as opposed to 0.3 mm accuracy and 0.7 – 3 mm point distance in Rapid Handheld Mode. Both modules should become available in Q2 2018 and pricing has not yet been announced. Of course I can’t wait to test these modules so follow me on your favorite social network to know when I’m going to do just that. For the SE and SP does this increase the resolution of the mesh it can scan or only add hi resolution colour texture map? I’ll be reviewing it soon to see if it’s worth the price for people that need good textures. Stay tuned!